I am so rich to have such a wonderful friend as Geri deGruy. We ‘met’ in the SAQA online critique group. I invited her to play along with the Arts in the Cards atc trading group and we got to know each other better as artists and people. Once in awhile there is that rare soul that you just make a connection with. Geri is one of those people. Imagine my surprise when I received a box in the mail with her return address. Inside was a box with 6 of her wonderful small art pieces. Not prints, the real deal! And the best part, besides being from her, is they were ‘just because’. How cool is that to have such a wonderful friend! Click her link above or on the photos below to visit her website. I think you will be in awe of her talent! My book cover is done. It had a coat of matte vanish applied after takng the photo. I also repaired the leaves on the edge. A photo is a great way to discover things that your eye doesn’t always see. 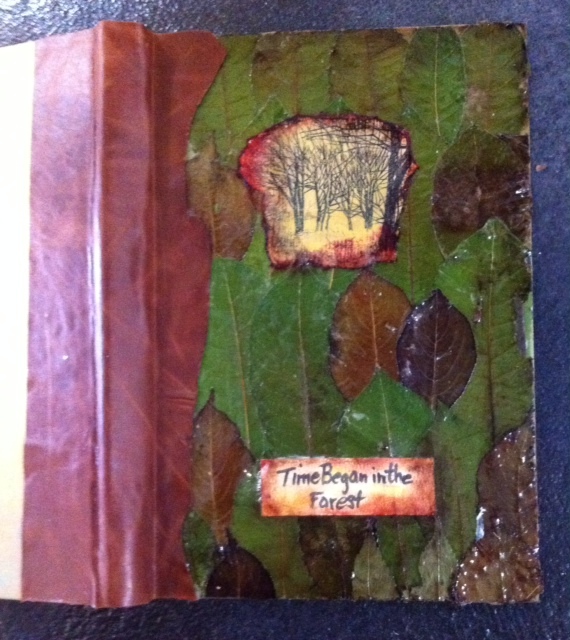 Now it is ready for all the wonderful art from the other artists in my book collaboration project. Love how easy it was to put the group together. What will I call myself and branding….. I am working on new business cards and branding. I don’t want to make a costly mistake. I need to take what I do to the next level in the new year. A friend asked me today why don’t I just use fiber artist or mixed media artist and also why does it matter so much. Below is my answer to those questions. I think people don’t understand fiber or mixed media artist…..and they certainly don’t understand quilt art. It seems that when I am out and about looking and purchasing odd items to use in my art the subject seems to come up with ” what do you do with it?”. 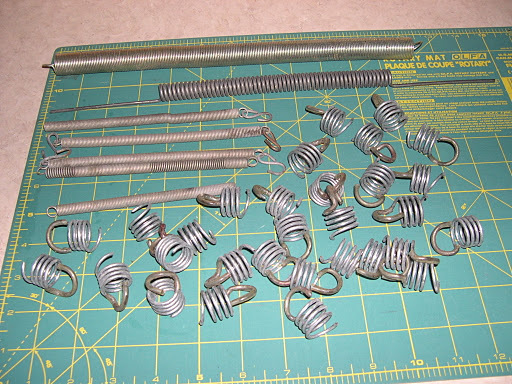 If I say I make art quilts they look totally perplexed since why on earth would I want a bag of hard springs for a soft quilt. Then I have to try to explain the difference in the quilt forms. If I say mixed media…almost nobody outside the art world has any idea what media means…they think it is TV, print media or Radio. So then it gets really confused. And as I found out in a fine art show, the judge expected mixed media to be a mix of drawing and painting media, not found objects or fiber. And then is fiber fabric or basketry? Way too much open interpretation and frustration for everyone. If we are trying to connect with buyers and clients, shouldn’t we use terminology that describes exactly what we do in simple terms? Most everyone can understand assemblage…the act of assembling. And everyone has some idea what art is. So, if we aren’t talking to people about what we do, it isn’t important. If we are talking to people and promoting ourselves it becomes really important. I’m really tired of feeling like I can’t talk about what I do because it turns people off when they don’t understand what you are saying. Makes them feel dumb and that is not a good thing. If you are a painter, basket maker, candle stick maker, weaver, tinsmith, jeweler….there is no problem. If we don’t use a term the public understands then we fit into that no man’s land of crafters. I’m still working on it, but I think I have decided what terminology to use as the subheading after artist. I was going to participate in Maxine’s UCM [aka unconventional materials] challenge. I even had the materials lined up. My ATC group was already doing a Hardware themed swap so it was a chance to work with UCM. I found out something important about myself….it isn’t for me. Doing the atcs, which you can see in the previous post, reminded me of all the reasons my art uses softer materials but still incorporates paint, dye and embellishments. It also started me thinking about some of the tags we like to use for our art…especially mixed media. I ask a question on the QA list. How do YOU as a fiber artist, quilter, art quilter or artist determine how to describe a piece that uses more than fabric and thread? If it has added beading would you call it mixed media? Where do you personally draw the line in the sand. Is there a line you cross that your piece is now assemblage art rather than an art quilt? I only got a couple of responses which was sad. I think it is an important question for our community to ponder. I will give you the links to a couple of assemblage art definitions. http://www.britannica.com/EBchecked/topic/39194/assemblage and also http://painting.about.com/od/artglossarya/g/defassemblage.htm. If you read these you will hopefully understand why I asked the question. The contemporary use of assemblage art is a kind of Mad Max art, which I love. It just isn’t the only interpretation. As we struggle to describe what we do as artists and the medium we choose to work with, I think it is important to use correct terminology. At an art show last year, I entered a couple of pieces into the mixed media category. Sounded right to me. The other entries in that category were pencil/ink/acrylic or some such combination. Yes, that is mixed media but not what those of us in the art quilt community think of as mixed media. Or the cloth, paper and scissors set either. I am simply trying to decide if I will continue to use the term art quilt or even fiber art for my artwork. I really like the Britannica definition and think it is going to require a lot of soul searching. Certainly to take my art past the level of people thinking it is for a bed by using ‘quilt’ should be a good thing. This has been talked to death on the SAQA [Studio Art Quilt Associates] list. But not one person even referenced the definition of assemblage as a viable option.